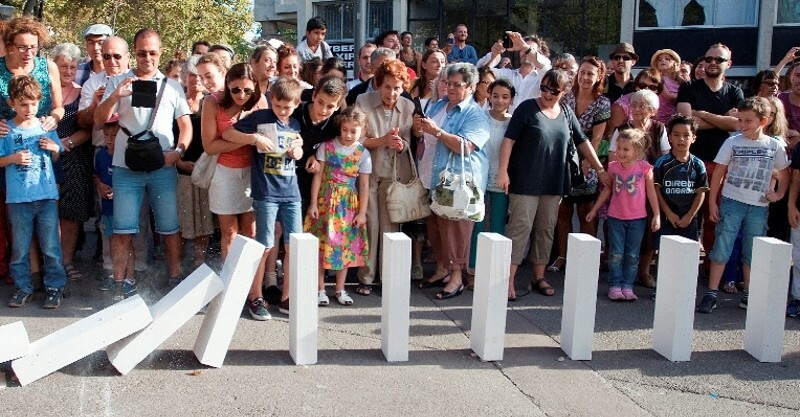 More than 7000 giant dominoes will snake along Melbourne’s footpaths, down laneways and through buildings in an Australian first event linking the city’s diverse communities in February – but your help is needed to make it happen. The free interactive spectacle will involve 2km of breezeblocks – large lightweight concrete building blocks – organised by the Arts Centre for the Betty Amsden Participation Program. The Melbourne event is the first time Dominoes has been presented outside of Europe after runs in more than 10 European cities including Copenhagen, Marseille, Helsinki and Ljubljana. Conceived and directed by UK’s Station House Opera, Dominoes was created to link the five host boroughs for the London Olympics Arts Festival. 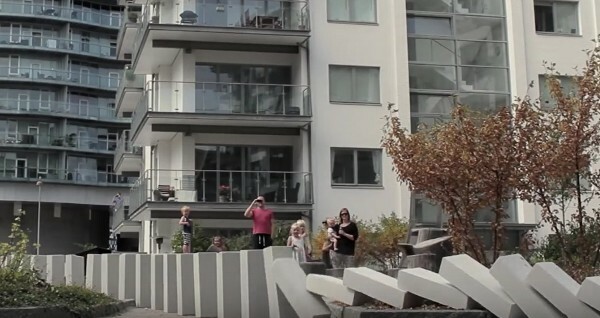 More than 7000 breezeblocks will be used to create a moving sculpture through the city, unfolding over the course of the day. The line will occasionally disappear from sight and then reappear, threading its way through historic and everyday parts of Melbourne on Saturday, February 6. Teams of volunteers will start setting up the blocks from the Melbourne Town Hall at 1pm. The dominoes will run all the way down to the Arts Centre via landmarks including St Paul’s Cathedral, the Flinders St Station underpass and Southbank pedestrian bridge along the way, with the first brick to fall at 5pm. The chain will run for more than 2kms – this’ll take about 25 minutes – and organisers have promised a spectacular finale at the end. Station House Opera and Arts Centre film teams will also record a series of small domino runs in Melbourne suburbs. The footage will be incorporated into a film of the large-scale Dominoes fall that will be available shortly after the event. The mini falls will be set up in locations including the bay, community housing and community centres, suburban streets, houses, sports facilities, a community kitchen, children’s playground, community garden, eateries and public gathering places. A map detailing the route will be available in January. Find all the details over at the Arts Centre Melbourne.